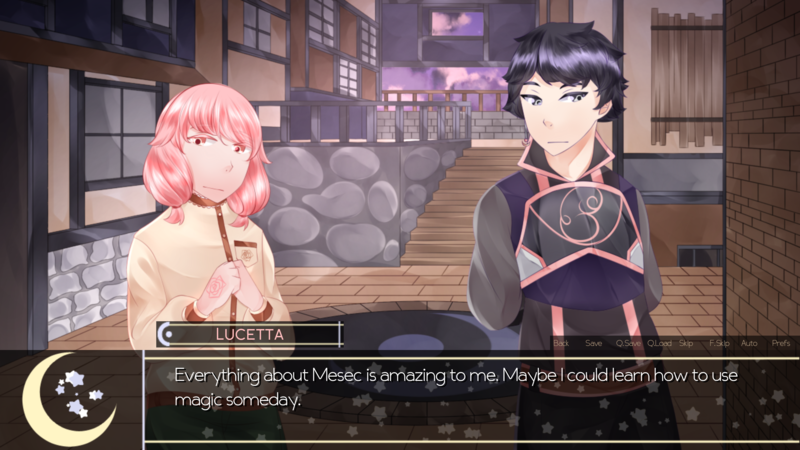 "Long ago, about eleven years before a certain other story..."
In a small island nation known as the Mesec Kingdom, Prince Vestr's eighteenth birthday soon approaches. Coming of age means coming one step closer to his spot on the throne, but that is the least of his problems. 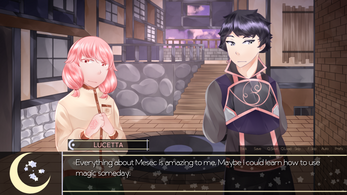 Now that he is about to enter adulthood, his father and mother both push for him to marry Princess Lucetta of Rosaria, a person who he only sees as a friend from another country. As nice a girl she is, his interests lie elsewhere. Vestr: The main character and the prince of the Mesec Kingdom. Flirtatious and lazy, he loves to tease people. Ninoslav: Vestr's bodyguard, one of his favorite people to pick on. More often than not, he's grumpy about something. The most likely cause is the prince. 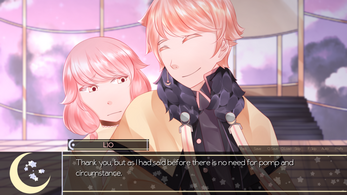 Lio: The Fifth King of Rosaria and Lucetta's older brother. A bit timid and soft-spoken, he tends to worry about things that most people would not. Arlo: Lio and Lucetta's bodyguard and a young knight from Rosaria. He doesn't talk very much, but can be quite blunt. Routes for Ninoslav and Lio, determined by the first three choices in the prologue. In other words, the first three choices are the only things that dictate the plot. Extras Page, which includes credits, developer's notes, etc. Questions you don't have to answer, but I'd appreciate it if you did! Which character did you like the best and why? Have you played Lost Royalty before, and if so, which of the two games did you like better so far? Would you like to see a longer version of this game? Keep in mind, any extension to it might be two chapters at most! 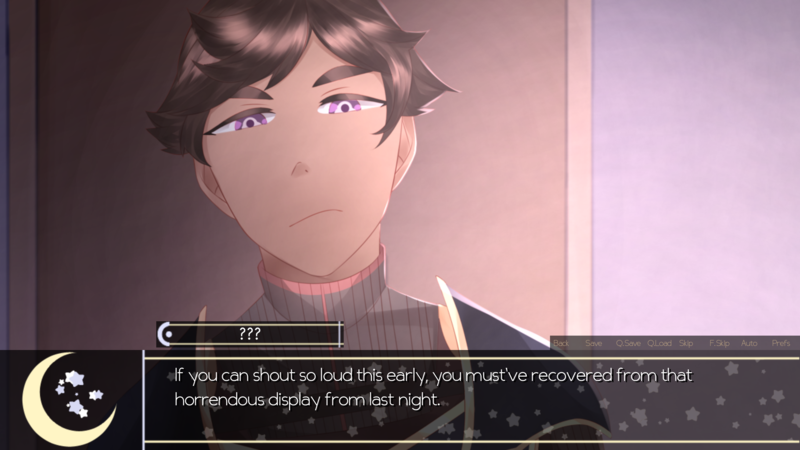 If there were to be an Ask Me Anything with me and/or the characters from this game/Lost Royalty, would you rather have it be through itch.io or through Tumblr? How could I make things more interactive for fans of this game and Lost Royalty (ex. Twitter, Discord, Tumblr, etc.)? Would you like it to be more interactive? If you would like to contact me about the game (errors, questions, etc. ), please contact me here! If it doesn't download right away, it's most likely because Chrome sees it as malicious and blocks it as a pop-up. Make sure you allow pop-ups from this site for the link to work. 1. Nino. He is such a hardass in the begining, but I think that just gives him more charm and more personality! The way him and Vestr interact feels real and the developtment of the relationship is so fun to read! 2. I have sadly not, but by far of any other VN's I have played, this is truely the best! In my eyes its hard to match this story and characters! 3. I would love to! The game is very cute and does feel complete with how it is now, but if it did get updated for more chapters, I wouldn't complain! 4. I feel that it would be easier to have a Q&A on tumblr rather than Itch.io. 5. Honestly, I feel that this is perfect the way it is. The extra's after completeing the game as well are a good way to get the player more immeresed. By explaining more of the thought process of each characters design and personality, to the bigger story that you wouldn't have seen unless it was explained! All in all, this game is truely amazing and i'll be sure to keep a watch on any other games you may post in the future! 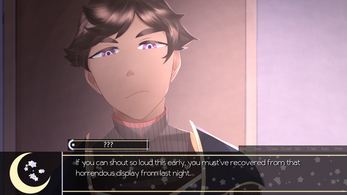 I wanted to tell you that I really enjoyed your game and your narration and everything! I like your art and GUI best, by the way. I like Ninoslav more than Lio, and of course, Vestr himself! Each character's personality is really unique and has their own distinct charms. I haven't played Lost Royalty before, but I WILL NOW! I think that the game is complete the way it is currently- I didn't even feel it was a demo. It's not so long, but not so short either. And umm... I don't know what to answer to your last questions, but I guess I'll support whatever you decide on.